Why blackbirds attack deer and a few other things I learned from watching and photographing wildlife last year. As regular listeners know, I take great pleasure in observing wildlife, whether I’m out for the specific purpose of doing that, or I’m just going from one place to another in the course of a normal day. As you also know, I enjoy looking into questions that arise from my observations, and sharing my findings. In today’s commentary I look back at some things I saw for the first time in 2015 and tell what I learned in my follow up investigations. 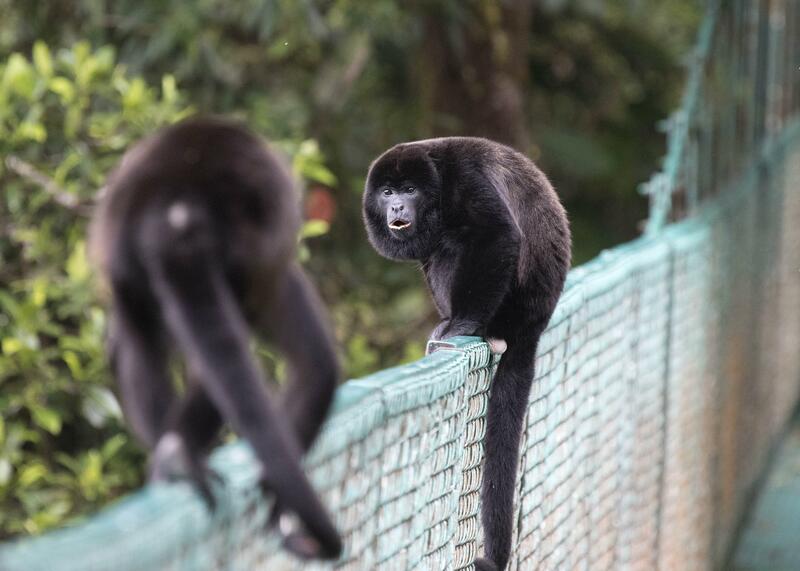 On the last day of a field trip to Costa Rica in March, I was walking with co-leader Laura Haber and a student across a treetop footbridge in the cloud forest when we encountered a small troop of howler monkeys headed in the opposite direction. The monkeys waited higher up in the trees while we passed, and then climbed down to use the bridge themselves. Why swing through the branches when you can take the bridge? In early May I was tallying birds with my friend Greg Lambeth for the annual Illinois spring bird count. On a country road north of Mahomet we came upon a red fox carrying a mouthful of voles, which are small rodents that are high on the foxes menu. Why didn’t he just eat them? Red fox pairs form lifelong bonds, and they live together through much of the year. During the weeks they have pups that are too young to be left alone in the den, the male partner brings back food for both his mate and the little ones. As I walked through the prairie restoration at Meadowbrook Park in Urbana in June, I witnessed the ferocity with which red-winged blackbirds defend their territory--even against intruders many times their size. 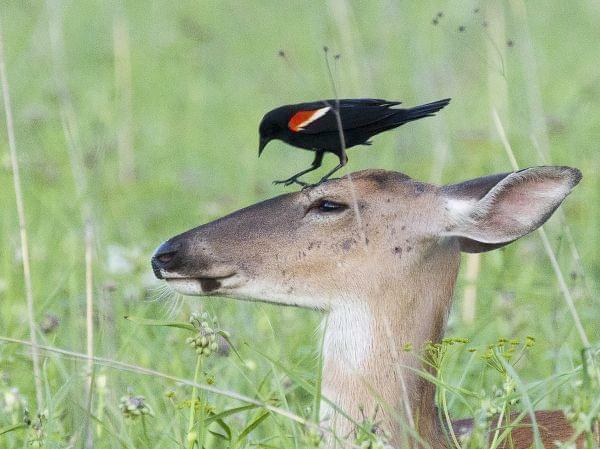 In this case, a blackbird was standing atop the head of a white-tailed deer and pecking it, while the deer tried to keep browsing as though nothing was the matter. Why was the bird so exercised about the deer? Perhaps he understood what scientists have only documented in recent years, which is that under the cover of darkness deer eat the nestlings of grassland birds, including red-winged blackbirds. One morning in July, I had stopped to photograph turtles at the Second Street Basin in Champaign when something moving among the flowers nearby caught my attention. It was colored black and yellow like a bumblebee, but it seemed closer in size to a hummingbird--and it flew like one, too. 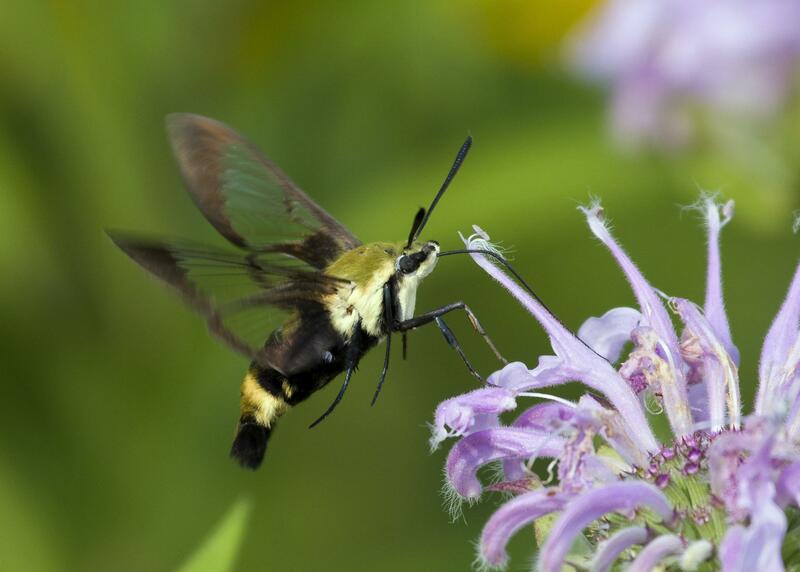 I had “discovered” a type of moth that was totally new to me, a snowberry clearwing. What’s more, I discovered it right in the middle of town, thanks to the fact that the City has used native plants to landscape the basin. As I passed through the same spot on my way home from work one evening in September, I stopped to photograph a very cooperative green heron stalking fish along the banks of the pond. Having no success that way, the heron picked up a crabapple in its bill and walked to the top of a flat rock where it could lean out over the water. Then it dropped the crabapple in and watched, thirty seconds or so in one place, then the same in another. 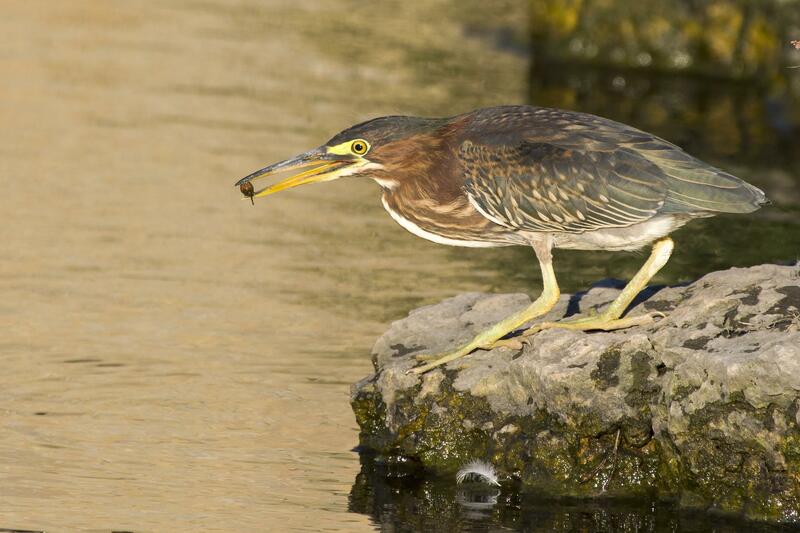 I scratched my head in wonder, until I remembered what green herons and I have in common; we both fish using lures. Sadly, for the heron, the fish weren’t biting that evening, at least not on crabapples. Things worked out better for me though, since he was posing so nicely pictures.